The standard current in Spain is 220V. Although a very small number of old buildings still may have 125V circuits. Therefore it is advisable to check before using electrical equipment in old or cheap hotels/hostels. Plugs are all of the two round pin type. 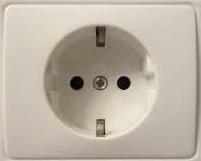 You can use electrical devices from the UK or Ireland with a plug adaptor. If you are using US (110V) equipment you will also need a current transformer to avoid meltdowns.